/EIN News/ -- EDMONTON, Alberta, Dec. 07, 2018 (GLOBE NEWSWIRE) -- How can homeowners looking to renovate ensure they don’t get burned by a contractor who ghosts, flakes or doesn’t build to code? With no official regulations for home improvement contractors, the risk is entirely on the individual. 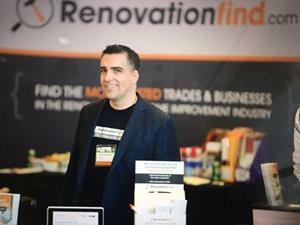 Something Keith Riley of RenovationFind.com is looking to change. Last year, RenovationFind surveyed 2,071 homeowners at home & garden shows in Winnipeg, Calgary, Vancouver and Edmonton. RenovationFind Certified is a symbol of integrity held by only the most trustworthy companies in home improvement, service, maintenance. RenovationFind.com is a free online directory of fully-certified contractors, tradespersons and home renovation companies. All the companies in the directory have been vetted by a third-party organization, and pass rigorous background checks for licensing, insurance, WCB/WSIB coverage and any legal or financial troubles. Once they are certified, companies are continually monitored for compliance with these standards. The list is limited—many contractors simply don’t make the cut. The Canadian home renovation industry has seen accelerating growth in the last few years. A housing report from Atlus Group, using Statistics Canada data, showed that homeowners spent $7.7-billion last year renovating their homes. That number is expected to increase by another 2.7 per cent this year. The report also shows that more homeowners are planning to spend money renovating their homes, instead of building or moving into a new property. The need for reliable renovation services is greater than ever before. Last year, RenovationFind surveyed 2,071 homeowners at home & garden shows in Winnipeg, Calgary, Vancouver and Edmonton. Their results showed that 91 per cent of homeowners who attended the shows planned on doing home renovations in the year to follow. 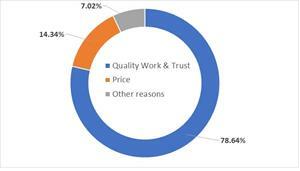 Of these, 79 per cent said that quality work and trustworthiness were more important than price in determining how they would choose a contractor. In fact, only 14 per cent stated price as being the main deciding factor. “In speaking with these homeowners, we found that trusting a contractor to do good work was far more important than price,” says Riley of their findings. RenovationFind’s research-based model is offered for free to the public. The companies and individuals listed on the site are continually monitored on seven important criteria including legal background and credit checks, Better Business Bureau (BBB) membership, licensing, insurance and Workers Compensation Board (WCB/WSIB) Coverage. Look for the RenovationFind certified logo when searching for the most trusted home service Edmonton Contractors, Calgary Contractors, Vancouver Contractors, Winnipeg Contractors and other major cities in Canada.